Yang migrated to work in Beijing in 2008 after seeing no hope in his hometown in the mountainous, impoverished region of Liangshan in Southwest China’s Sichuan province. For generations, his family lived off farming and barely saved up enough money for his education. Poverty finally forced Yang out of junior middle school. A forced smile coated with agony appears on his face as he recalls the details. Even in cities like Beijing, which has a population of 19.7 million, undergraduates from elite universities sometimes need impressive resumes to guarantee a job. With a diploma from elementary school, Yang’s instinct was to strive and survive, trying 11 jobs in the first six months after arriving in the capital. "I delivered cakes at a bakery, waiter at a restaurant… and the worst memory was I ate Mantou without money to buy pickles or salt.” Mantou is a kind of Chinese steamed bread that people seldom eat without other dishes. Yang now works about two and a half hours per day at a restaurant as a guitarist and singer after teaching himself to play. Of his 1,700 yuan monthly salary, one quarter goes on rent, one quarter on food, and he also needs to send money to his mother back in his hometown. To keep his mind, body and soul in tune, he also plays at subway stations or underground passages as a street musician. It is not an easy job for Yang because the chengguan, urban management officers, or police constantly haul him away. Yang had a guitar confiscated by the chengguan, who also ordered him to pay 50 yuan as a fine for playing in a public place without permission. At best, he earns 400 yuan a day by playing on the street. 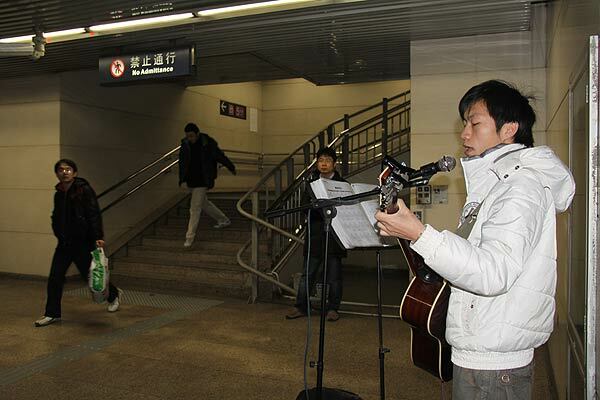 At the Qianmen Street, one of the most popular historical sites in Beijing, his performance of the song Friends moved a young man to empty his pockets. However, there are also times he makes only two yuan, barely enough for a bag of instant noodles. Life is not always about playing the guitar with no stable income, or playing hide-and-seek from the chengguan. The best reward for Yang is his girlfriend who he met through singing. Yang’s dream is to open his own guitar shop in the future and release an album this year, which is now in the post-editing stage.